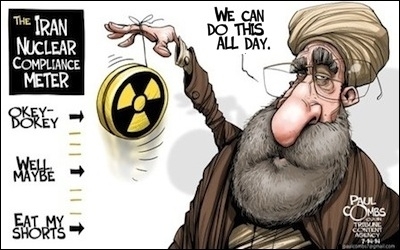 Originally published under the title, "Creepin': Here's How Iran Will Really Build the Bomb." In assessing whether the Joint Comprehensive Plan of Action (JCPOA) signed by the P5+1 world powers and Iran last week is an adequate safeguard against the latter's pursuit of a nuclear weapon, Obama administration officials and arms control wonks typically discuss two heavily stylized breakout scenarios. In an overt breakout, Iran brushes aside nuclear inspectors and begins openly racing to enrich weapons grade uranium (WGU) using its two declared enrichment plants at Natanz and Fordow. The JCPOA ostensibly blocks this path by limiting the number of centrifuges Iran can operate to 5,060 and capping the amount of low-enriched uranium (LEU) it can keep on hand to use as feedstock at 300 kilograms. This supposedly lengthens its breakout time—how quickly it can produce sufficient fissile material for one atomic bomb should it make a rush to build one—from two or three months at present to at least a year, giving the international community more time to mobilize a response to the breakout. 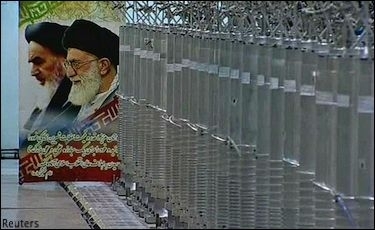 In a covert breakout, or sneakout, Iran builds parallel infrastructure in secret to produce the fissile material for a bomb. The JCPOA ostensibly blocks this path with an inspections regime designed to detect the diversion of fissile material, the construction of illicit centrifuges, off-the-books uranium mining, and so forth. The terms of the JCPOA make small-scale cheating virtually unpunishable. Though much ink has been spilled about whether these two "paths" to the bomb have been blocked, both presuppose a decision by Iran to sacrifice its reconciliation with the world in the next ten to fifteen years for the immediate gratification of building a weapon (the purpose of a covert breakout is less to avoid detection before crossing the finish line than to make the process less vulnerable to decisive disruption). Such an abrupt change of heart by the Iranian regime is certainly possible, but more worrisome is the prospect that Iran's nuclear policy after the agreement goes into effect will be much the same as it was before—comply with the letter and spirit of its obligations only to the degree necessary to ward off unacceptably costly consequences. This will likely take the form of what I call nuclear creepout—activities, both open and covert, legal and illicit, designed to negate JCPOA restrictions without triggering costly multilateral reprisals. The text of the JCPOA appears designed to give the Iranians wide latitude to interpret their own obligations. It is important to bear in mind that the JCPOA bars signatories from re-imposing any sanctions or their equivalents on Iran, except by way of a United Nations Security Council resolution restoring sanctions. "That means there will be no punishments for anything less than a capital crime," explains Robert Satloff. The language demanded by Iranian negotiators, and accepted by the Obama administration, makes small-scale cheating virtually unpunishable. Moreover, the specific terms of the JCPOA appear to have been designed to give the Iranians wide latitude to interpret their own obligations. Two, in particular, should raise eyebrows. About 1,000 kilograms of LEU is supposedly needed to produce, through further enrichment, enough weapons grade uranium for a nuclear explosive device (let's assume for sake of argument that the Obama administration's erroneous math is correct). This is what inspectors call a "significant quantity" (SQ). The JCPOA's requirement that Iran "keep its uranium stockpile under 300 kilograms" would force it to enrich a substantial quantity of natural uranium all the way up to weapons grade, thereby lengthening the process of producing a SQ by several months. Iran is allowed to operate 5,060 IR-1 centrifuges under the terms of the JCPOA. But what exactly happens to LEU produced by Iranian centrifuges in excess of the 300-kilogram limit? The JCPOA appendix says it "will be down blended to natural uranium level or be sold on the international market and delivered to the international buyer." Maintenance of the 300 kilogram limit relies upon Iran continually and punctually reprocessing or transferring material it already possesses. What happens if Iran's handling of all this is less than perfect? Suppose 100 kilograms or so of LEU in the process of being down-blended or delivered to an "international buyer" of Iran's choosing routinely remains recoverable at any one time because of apparent inefficiencies and bottlenecks. Would the international community be willing to cancel the JCPOA over this infraction? Almost certainly not. What if this number swelled periodically to 150 or 200 kilograms every so often because of some special complication or another, like a breakout of plant machinery or truck drivers' strike? Probably not. Since an overt breakout attempt would likely commence at one of these peaks in LEU availability (and when smaller amounts of medium enriched uranium have yet to be converted or transferred), we can knock a month or so off its breakout time. The Obama administration's one-year breakout time calculation assumes that Iran uses only the 5,060 IR-1 centrifuges it is allowed to have spinning under the JCPOA—and that it does not bring more into operation for a whole year after kicking out inspectors and beginning a sprint for a nuke. This could have been achieved by dismantling the large majority of its roughly 15,000 excess centrifuges falling outside this quota, but Iran insisted from the beginning that it would never destroy any of them and its adversaries eventually caved. Although U.S negotiators reportedly proposed a variety of disablement mechanisms designed to slow down the process of reconnecting them, all were rejected by the Iranians and the final agreement makes no mention of any. The JCPOA requires only that excess centrifuges and associated equipment at Natanz be disconnected and put into IAEA-monitored storage on-site. At the Fordow facility, buried deep underground, Iran is allowed to keep "no more than 1044 IR-1 centrifuge machines at one wing" installed, but not enriching uranium. There is considerable disagreement among informed analysts about how long it would take the Iranians to get an appreciable number of these excess machines up and running, with estimates ranging from a few to several months. Whatever that length of time is, the Iranians can surely shorten it by training personnel to rapidly reactivate centrifuge cascades, modernizing equipment, acquiring new technology, and other methods not explicitly barred by the JCPOA. The real danger is that the mullahs will put off a breakout attempt while creeping out of their vaguely worded obligations. Indeed, the JCPOA appears to have been drafted by diplomats who failed to imagine that the Iranians might seek to bolster their latent nuclear weapons capacity under the new rules of the game with as much guile and gusto as they did under the old. Considering that the Obama administration's one-year projected breakout time for Iran is deeply flawed to begin with, Iranian exploitation of these loopholes could bring it perilously close to the finish line even while remaining officially in compliance with the JCPOA. If the international community has less time to respond to a breakout attempt, an attempt presumably becomes more likely. But the real danger is that the mullahs will put off a breakout attempt in the next decade or so, while creeping out of their vaguely worded obligations. With so many opportunities to escape the strictures of the JCPOA, the mullahs would be fools not to offer the minimal degree of compliance necessary to keep it in force (while continually stretching the boundaries of how minimal that degree can be). Openly exploiting the JCPOA's loopholes while enjoying its rewards will do more to intimidate Iran's regional rivals than a reckless dash for the end zone or a high-risk covert attempt, while paving the way for eventual grudging international acquiescence to the Islamic Republic's construction of a bomb. Gary C. Gambill is a research fellow at the Middle East Forum and former editor of Middle East Intelligence Bulletin.